All of us have experienced the merciless effects of the “law of unintended consequences” at one time or another. We do something that we think is good or proactive, only to discover that there are negative effects produced as byproducts of our good intent. The creation of an unanticipated pejorative result from purposeful action is classified as an unintended consequence, and the government is masterful at it. Perhaps the granddaddy of them all is about to be enacted on July 1, 2014 . In March of 2010 the HIRE Act (Hiring Incentives to Restore Employment Act) was signed into law by the president, having been passed by the House under Speaker Pelosi, and the Senate under Harry Reid. It was designed as a bill that would provide incentives for employers to start creating jobs again. 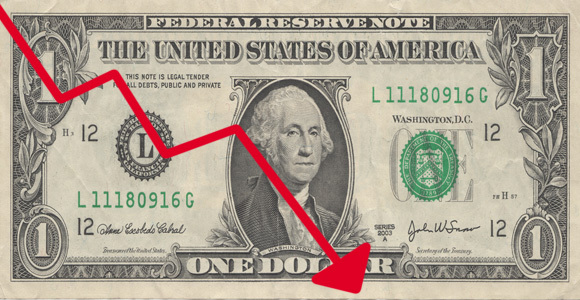 The bill’s efficacy could be debated, but one component of the law could prove debilitating to the dollar as the global reserve currency and the nation’s ability to finance our debt and deficit. FATCA is creating a data retrieval system that some have compared with the NSA’s (National Security Administration) meta-data information dragnet. It requires all non-U.S. based financial institutions, including banks, credit unions, insurance companies, investment and pension funds, to provide data on all specified U.S. accounts to the IRS (Internal Revenue Service). 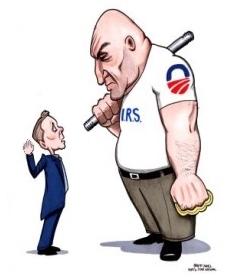 From that data, the IRS will attempt to collect taxes on revenue from overseas-based accounts of U.S. citizens. There could be as much as about $800 million a year that could be collected by the IRS from implementation of FATCA, according to the Joint Committee on Taxation. 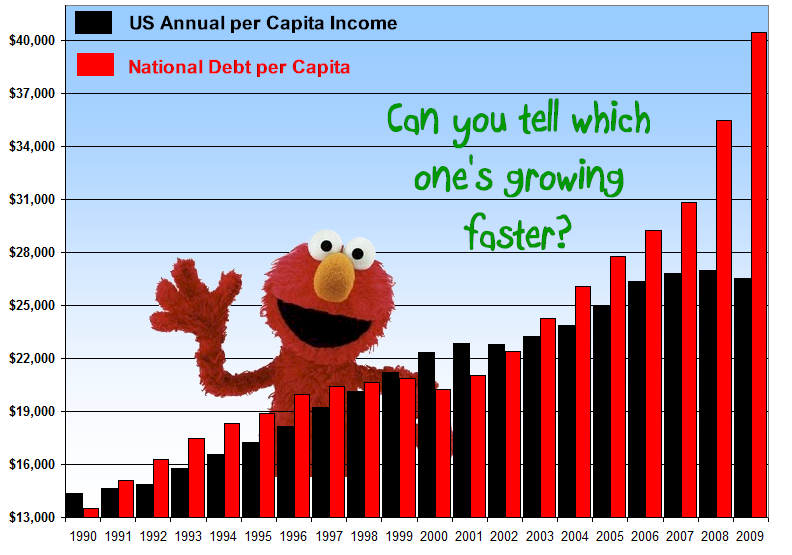 Based on the nation’s current spending level, that’s enough to run the government for about two hours. In other words, we will not pay, as we have “guaranteed” in the past, full payment of interest on our debt, at least to those classified as “recalcitrant.” Such a partial payment is classified as a “default.” In this case, it’s a willful default, since the full interest payment will be withheld in favor of a reduced payment. Even the possibility of the U.S. intentionally defaulting on some of its debt interest payments is creating some uncertainly in foreign markets. 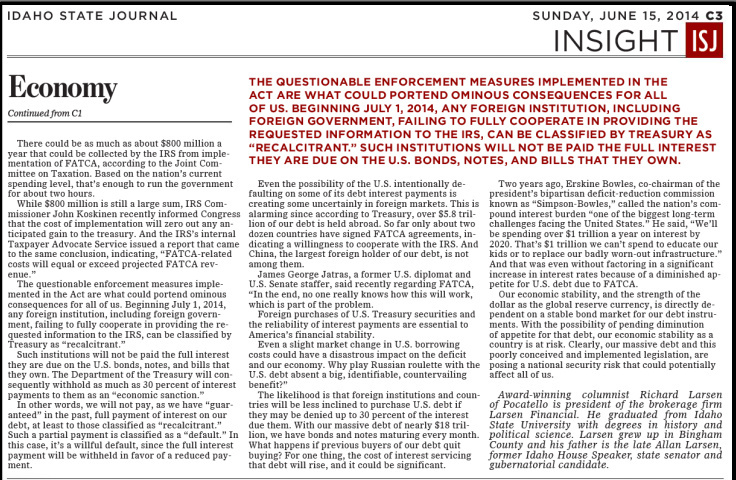 This is alarming since according to Treasury, over $5.8 trillion of our debt is held abroad. So far only about two dozen countries have signed FATCA agreements, indicating a willingness to cooperate with the IRS. And China, the largest foreign holder of our debt, is not among them. The likelihood is that foreign institutions and countries will be less inclined to purchase U.S. debt if they may be denied up to 30% of the interest due them. With our massive debt of nearly $18 trillion, we have bonds and notes maturing every month. What happens if previous buyers of our debt quit buying? For one thing, the cost of interest servicing that debt will rise, and it could be significant. Two years ago, Erskine Bowles, co-chairman of the president’s bipartisan deficit-reduction commission known as “Simpson-Bowles,” called the nation’s compound interest burden “one of the biggest long-term challenges facing the United States.” He said, “We’ll be spending over $1 trillion a year on interest by 2020. 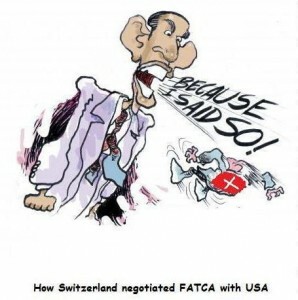 That’s $1 trillion we can’t spend to educate our kids or to replace our badly worn-out infrastructure.” And that was even without factoring in a significant increase in interest rates because of a diminished appetite for U.S. debt due to FATCA. Our economic stability, and the strength of the dollar as the global reserve currency, is directly dependent on a stable bond market for our debt instruments. 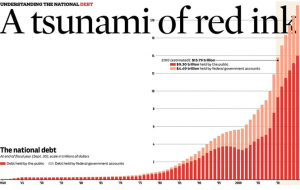 With the possibility of pending diminution of appetite for that debt, our economic stability as a country is at risk. 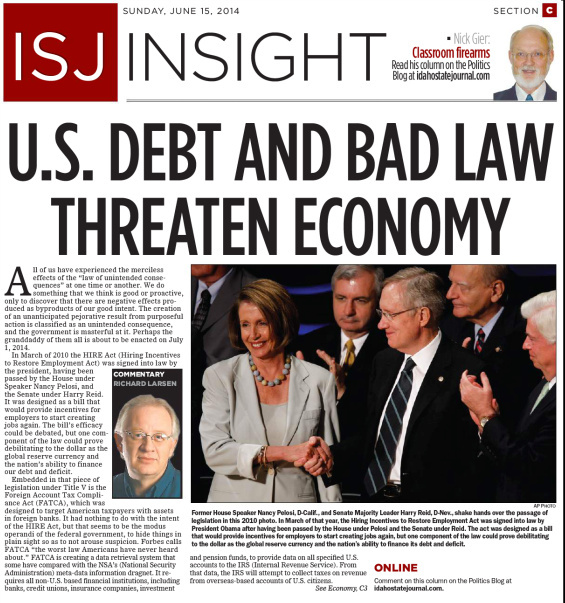 Clearly, our massive debt and this poorly conceived and implemented legislation, are posing a national security risk that could potentially affect all of us.